The Lexington Brewing Company out of Lexington, Kentucky are reportedly the only locally-brewed beer in that area. Their primary beer is the Kentucky Ale, a hybrid between an English Pale Ale and an Irish Red Ale. In addition to being brewed with barley malt, it is also brewed with a "pinch" of wheat malt, giving it further dimensions of character. Lexington Brewing's other beers are the Kentucky Ale Light and a bourbon barrel-aged version of the Kentucky Ale that is higher in ABV. Seeing as how the bottle says Kentucky Ale is a hybrid between an English Pale Ale and an Irish Red, I was excited since I've never had such a hybrid. 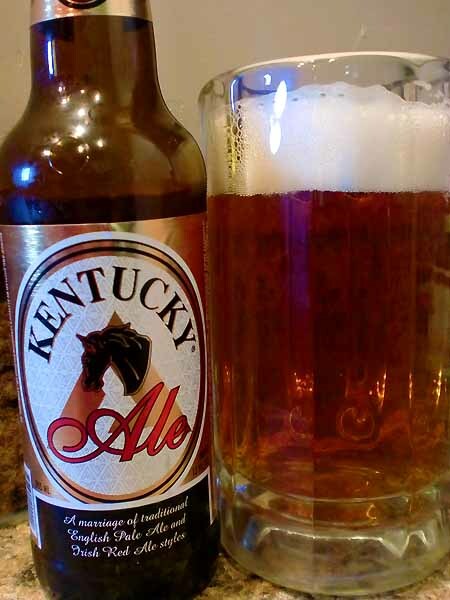 Kentucky Ale pours a crystal clear, red amber color. It smells like mild sweet malts with a slight background of hops. Tasting it reveals some interesting characteristics. Each sip tastes like a classic Irish Red at the start, sweet and malty caramel, but finishes tasting like a lighter English Pale Ale (English Pale Ales tend to be more mild than India Pale Ales, but similarly dry with hops being the dominant flavor). This transition between the two flavors is very evident and well-done, making a very delicious marriage, combining the best parts of both styles. I would say it still tends to lean more heavily on the Irish Red side of things, overall, but it really is a great twist on the style and considerably better than many similar beers. Drink This: if you enjoy Irish Red Ales or English Pale Ales. This really is a great hybrid between the two styles, and it's light enough that a person could drink quite a few in one sitting. Don't Drink This: if you are looking for something dark and heavy, or over-the-top. This is more mild, and as such, will appeal to a wider array of drinkers. Many people would love this beer. Good stuff!